In my retirement ... in January I'm excited to be celebrating my 60th Birthday! What a milestone! Daughter Sophie made a berry meringue 'cake' shaped as the letters 6 and 0 - she knows meringue is my favourite! Thanks, Sophie!!! We are planning a bigger family function next weekend when it will be possible to assemble people together from far flung places! I'm looking forward to it! In my retirement ... in January we stayed for a few days in the lovely town of Clare in the heart of the famous Clare Valley wine growing region. We had to taste a wine or two, and had a superb meal at The Rising Sun Hotel in the pretty township of Auburn! In my retirement ... in January we visited Burra and drove past the home built in 1855 by my great-great-grandfather Heinrich Christian Wilhelm Fuss. Migrating from Clausthal Zellerfield in the Hartz Mountains, Germany he was the Charge Yard Supervisor of the Burra Smelter from 1847 until the 1860's. I'd love to have a peek inside! In my retirement ... in January while in Burra we stopped for excellent coffee and fabulous scones at the delightful Gaslight Collectables and Old Books store. Browsing the shelves, to my amazement and delight, I found an old copy of my most favourite book from my primary school days at Yeelanna Primary School - 'The Swiss Family Robinson' by M Wiss. I read that book time and time again and have looked for a copy, complete with the coloured plate pictures, for years! I will enjoy re-reading it and sharing it with my grandsons! In my retirement ... in January the garden is flourishing! I am amazed at what one raised garden bed can produce! I really do enjoy watching it grow and have been recording it here! In my retirement ... in January we are having fun at the beach with Grandsons 1 and 2! 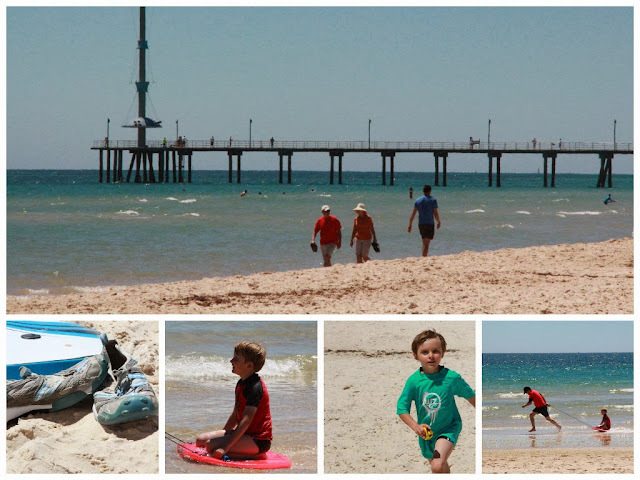 Adelaide is blessed with beautiful beaches and we intend to make good use of them this summer! In my retirement ... in January my last offical day as an employee of DECD will be January 22. From January 23 - I will be retired and the challenge of living well in retirement will really begin!!! I can't wait! Thanks for visiting - feel free to leave me a comment! Marian you look so happy,I wish you all the best for the future. Enjoy every precious moment. Thank you for your kind words, Ann! I've learned that life is too short to be miserable! Gosh, Marian, that photo with your husband & grandsons is lovely. You certainly don't look 60! I don't look like that now & have a few years to go till 60! Hi Pam! Thank you so much for your very kind observations! Retirement has a way of relaxing the wrinkles I've found! I have great memories of those Q School sessions - it was such a privilege to work with, and support, people like yourself - aspiring school leaders across our state. Our students deserve only the best!